The city of Cleveland Ohio is a major industrial port. It handles a variety of dry and liquid bulk commodities as well as a significant amount of manufactured goods. Cleveland (originally spelled Cleaveland) was established in 1814 and grew to become a major manufacturing center. Its location on the Great Lakes made it a natural shipping hub for raw materials and finished goods. The 1970's saw a significant decline in Cleveland's fortunes. But, by the mid-80's, Cleveland was making a comeback and part of that process included a revitalized waterfront. Gone is the grimy, industrial port of past decades. Today, Cleveland's waterfront is an attractive and appealing port of call for sailors. Cultural attractions, restaurants and museums all combine to make Cleveland an attractive destination for cruising sailors or an interesting stop-over on a longer trip. The approaches to the city of Cleveland Ohio are clear from all directions. The harbor lies behind a 4.3 nm breakwater. There are 3 entrances: the main entrance near the westerly end and one entrance at either end. The main entrance is well-marked with 2 protective seawalls angling out into the lake to provide a protected passage. The seawall ends are marked with and ISO GREEN on the east side and a Fl RED on the west side. Once inside these seawalls, follow the channel through the opening in the breakwater. The sides of this opening are marked with a Fl GREEN and Fl RED light. NOTE Other than the navigation lights at the entrance through the breakwater, there are no lights along this seawall. I can speak from personal experience that at night, it can be very difficult to pick out the breakwater with the city's bright lights in the background. Make your way very carefully or, even better, time your entry to happen during daylight hours. The east entrance is marked with an ISO RED light on the end of the breakwater. Just inside the breakwater, there is a channel marker showing a a Fl GREEN light. This entrance is wide and would be a good entry. The western entrance into Cleveland harbor is through the Edgewater Cut. This entrance is narrower. There is a Q GREEN light on the end of the east pier and a Fl RED on the end of the west pier - both marking the entrance. From within the entrance, you will see a RWG ISO light, visible 3 mi/2.67 nm. If you keep within the White sector, you will come in on a course of approximately 138oT. Once inside the entrance, you have 2 choices. To your port is the entrance into the main harbor. Altering course to 070oT will bring you through that entrance. It is marked with a Fl GREEN to port and Fl RED to starboard. To your starboard, will be the entrance into the Edgewater Basin where both Edgewater Marina and Edgewater Yacht Club are located. There are a number of fine marinas and yacht clubs across the city of Cleveland's waterfront. This listing will take you from the east to west. ICYC is located outside the eastern entrance to Cleveland Harbor. There is a Fl GREEN light marking the entrance to the channel into the club. There is transient docking for I-LYA members. There is water and power available dockside. Restrooms and showers are available in the clubhouse. East 55th Street Marina is located just inside the channel. The entrance will be on your port beam approximately .5 nm past the Fl GREEN "G1" channel marker. A course change to 124oT will bring you to the entrance which lies on a north-south axis. The entrance is marked with a Fl GREEN and Fl RED light. East 55th Street Marina is an Ohio State Park and sister marina to Edgewater Marina at the west end of the harbor. 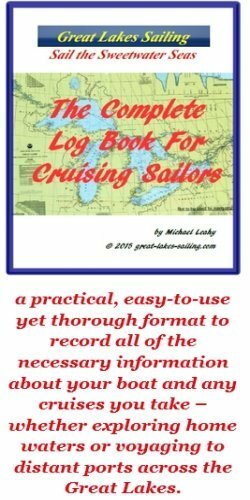 They have 20 transient slips available for cruising sailors. There is a videophone for customs reporting. There is a fuel dock (diesel and gasoline). Water and power are available at each slip. There is a pumpout station. There are restrooms and showers available. There is an on-site restaurant and bar. There are outdoor patios as well as an indoor seating area. This small yacht club is located at the East 55th Street Marina. They are members of I-LYA. Information about guest docking is most likely available from the marina staff. at (216) 391-5566. FCYC is located about .5 nm west of East 55th Street Marina. This is a great club that I have very fond memories of. - more about that in a minute. They have several slips available for transient sailors. There is a fuel dock (gasoline only) and a pump-out station. Water and power are available dockside. The clubhouse has restrooms and showers. There is a comfortable lounge (with fireplace for cool evenings!). The grounds are lovely with terrific views of the lake. There is a childrens' playground area, picnic areas and BBQ grills. There is internet access. What is far more important to me - both back then and today - is the incredible hospitality this club showed to me, my family and the people under my care when we were in a distress situation in Cleveland. Very briefly, I was sailing from Long Point Bay to Sandusky with another boat. We both had our families on board - wives and young children. In Cleveland harbor, the other boat struck an uncharted obstruction, was grounded and began to take on water. We took his family on board our boat while he worked with Harbor Police and Coast Guard to stabilize the situation. The real challenge is that we were in a busy channel and it was a Friday afternoon - LOTS of traffic. Almost immediately, a boat drew up beside us and offered to guide us to a safe harbor. In a strange harbor, outside your country, with a boat full of frightened, crying children, worried parents and a mate in trouble, that was indeed a welcome offer. The safe harbor turned out to be Forest City Yacht Club. For the 4 or 5 days that we stayed there while things were put right with my mate's boat, the hospitality was simply outstanding. The members were kind, friendly and welcoming. Frankly, it was humbling to see how they extended themselves to strangers who ended up in their midst on a beautiful weekend. I have never forgotten that. This is certainly a club and a group of sailors you would be proud to associate with. LYC is located west of FCYC about .5 nm to the west of the municipal light plant. They have over 200 slips with 20 set aside for transient sailors. There is a fuel dock (diesel and gasoline) and a pump-out station. There is water and power to the slips. The clubhouse has restrooms, showers and laundry facilities. The club has an upscale dining room with lovely views of the harbor and the city and a relaxed lounge. Grounds have a childrens' playground and swimming pool. There is a haul-out facility and internet service is available. Whisky Island Marina is located immediately west of the mouth of the Cuyahoga River. The entrance is marked with Fl GREEN and Fl RED lights. This is a full-service marina. They have approximately a dozen transient slips available. There is no fuel dock but there is a pump-out station. Water and power are available dockside. General maintenance and repairs can be obtained for diesel and gasoline engines, mechanical and electrical systems, rigging and props. There is a haul-out facility as well. There are restrooms, showers and laundry facilities. The marina has a restaurant on-site and adjacent Wendy Park has picnic areas and BBQ grills. There is internet access. Edgewater Marina is located at the west end of Cleveland harbor in the Edgewater Basin, just outside the main harbor. Access is via the Edgewater Cut, with the entrance to the Basin on the South side of the Cut. Keep the ISO light on your port beam as you enter. When you clear the inner breakwater, Edgewater Marina will be on your port. The fuel dock and office are on the south wall of the basin. This is a State park and sister marina to East 55th Street Marina. They have approximately 2 dozen slips available for transient sailors. There is a fuel dock (diesel and gasoline) and a pump-out station. Water and power are available at slips. There is a full-time mechanic on-site who can provide maintenance service and assistance for engines and electrical systems. There are restrooms and showers available as well as picnic areas. EYC is located in the Edgewater Basin, immediately west of the main harbor. Entrance is via a channel on the south side of the Edgewater Cut. Leave the ISO light on your port as you enter the channel. When you clear the inner breakwaters, EYC is directly across the Basin on the west wall. The club has nearly 400 slips and a number are set aside for transient sailors. There is a fuel dock (diesel and gasoline) and a pump-out station. Water and power are available dockside. There is a travel lift. The clubhouse has restrooms, showers and laundry facilities. There is a restaurant and bar. Other amenities include an outdoor dining patio, childrens' playground, swimming pool and picnic areas with BBQ grills. There is internet access. ORYC is located up the Cuyahoga River. The mouth of the Cuyahoga River is marked with flanking Fl RED and Fl GREEN lights. In addition, on the west side of the entrance is a white tower remaining from the former U.S. Coast Guard station. Enter the river and pass under the lift bridge. bridge masters monitor VHF 16 and use VHF 13 as their working channel. When you come to the fork in the river, bear to starboard and enter the Old River channel. Follow the channel for about .75 nm til you come to the yacht club on your starboard side. Be aware that the river is very busy with a good deal of commercial traffic. Keep a sharp lookout and be prepared to give way early and quickly. ORYC is an I-LYA member club. With about 200 slips, they keep several available for transient sailors but it is necessary to call ahead to make reservations. There is no fuel dock or pump-out station. There is water and power to each slip as well as telephone and cable TV connections. They have restrooms, showers and laundry facilities available at their clubhouse. At the clubhouse, they also have an on-site restaurant and bar. Other amenities include a swimming pool. jacuzzi, picnic areas and BBQ grills. Channel Park Marina is located immediately west of ORYC. This is a full-service marina. As you approach the end of the channel, enter the basin on your starboard. NOTE: the charts show a log boom across the river immediately west of the entrance. There are approximately 6 slips available for transient sailors. There is a fuel dock (gasoline only) and a pump-out station. Water and power are available dockside. They are able to carry out full engine and mechanical repairs as well as prop work, fiberglass repairs and canvas work. There are restrooms and showers available. On the grounds are picnic and BBQ areas as well as a childrens' playground. NERYC is located approximately 4 nm east of the eastern entrance to Cleveland harbor. The entrance to their well-protected basin is at the northeast corner and is marked with Fl RED and Fl GREEN lights. NERYC is an I-LYA member and has several slips available for transient sailors. There is a fuel dock (diesel and gasoline) and a pump-out station. There is a travel lift. Water and power are available at dockside. The clubhouse has restrooms and showers. There are full kitchen facilities. The grounds have picnic areas, BBQ grills and a childrens' play area. WYC is located approximately 1 nm east of NERYC. It is adjacent to Wildwood State Park. There are several transient slips available. There is no fuel dock or pump-out station. The club has restrooms and showers in their clubhouse which also has a full kitchen facility. There is a deck and picnic area with BBQ grills. Being adjacent to the park, visitors can enjoy walking trails and a lovely sandy beach. There really is no suitable areas for anchorage. As a major city and port, the city of Cleveland Ohio has all of the repair and maintenance facilities a sailor could need. The following is a list of several waterfront locations where such work can be done. Riverfront Yacht Service is a full-service marina that can carry out engine, mechanical, eloectrical, fiberglass and woodworking repairs and maintenance. There is no grocery store within walking distance as all are south of Interstate 90 - not something you want to try crossing while juggling 2 bags of groceries and a jug of milk! However, as a major city, there is no lack of choice. Constantino's Market, on the west side of the Cuyahoga River, is likely the closest grocery store with the widest selection. Car ride necessary. There are a number of major banks as well as ATM locations downtown. All are south of the freeway. You would need a ride to get to them. The city of Cleveland has a number of major health-care providers. Metro Health (216-778-7800) is a large, comprehensive health care service provider with 17 locations in and around the Cleveland area. Its mail center is located south of the harbor, approximately 3 mi/4.5 km. There are many pharmacies across Cleveland. The closest is a CSV Pharmacy (216-621-6019) located downtown, south of the harbor. You would need to take a taxi. All medical specialties are available in Cleveland. As any major city would, the Cleveland Ohio has a vibrant restaurant and pub scene with places to appeal to everyone's tastes and budget. The revitalized waterfront has a variety of places to enjoy. Here are a few to consider. Pier W is an upscale dining room with an emphasis on seafood. Meals can be enjoyed with a great view. Shooters is located along the river It has a very popular outdoor patio. The menu runs to steaks and chops and there is quite a selection of interesting salads. Docking is available for patrons. Riverwalk Cafe is located at the top of the Powerhouse Complex. There is a roof-top deck with great views of the harbor. The menu is casual leaning towards sandwiches, salads, seafood and pizza. Sunset Grill is located at the Whisky Island Marina. The atmosphere and menu are casual. They strive to present a beachfront, cabana image that recalls the Caribbean. The bar is a refurbished sailboat! Beyond these few selections, the city'ds tourism office will have lists of places away from the waterfront that you can try. And there would be no end of suggestions in response to a question at the bar of one of the yacht clubs. Cleveland has put a great deal of effort into revitalizing its waterfront and the effort was worth it. There is lots for a visiting sailor to see and do. The city's tourism office will have many suggestions but here are a few. Cleveland is known for the Rock and Roll Hall of Fame This center has a very modernistic archetectural style and is a true shrine to rock and roll music. Next door is the Great Lakes Science Center. This is an outstanding, interactive science learning facility. Especially if you have kids on board, this is a 'do not miss' venue. FirstEnergy Powerhouse is located at the Nautica Entertainment Complex about .25 nm up from the river mout on the west side of the river. A former powerhouse, it is now home to a state-of-the-art aquarium, concert venueshops and restaurants. It also offers spectacular views of Cleveland's skyline in the evening. You can even sail up to its visitor docks. For shoppers, Tower City Center is a huge downtown mall complex accessible by public transit. Look through the City of Cleveland Ohio tourism site which will give you all kinds of ideas on getting the most out of your visit.